Let's go make some fantastic Caesar Salada! Blend all ingredients (EXCEPT the egg) well with a whisk (or fork) until smooth. Avoid crushing the capers as they should be whole in the salad. Put the egg into boiling water and cook for 1 to 1 1/2 minute. remove, open, and scoop the egg into the dressing. Mix well with the whip or fork (or what ever implement you've chosen to mix your dressing ingredients) still avoiding crushing the capers. Tear the (properly dried) lettuce into the bowl. Sprinkle grated parmesan cheese over lettuce and mix lightly. Spoon salad dressing over mixture and toss gently. Do not over-dress. 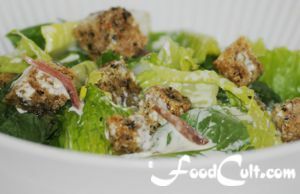 Too much dressing takes away from the flavours of the lettuce, croutons and other ingredients. Salad dressings are said to be best after they have stood (in the fridge) over night and this is true, too, for dressings for Caesar's Salad. We used to prepare it the same day but now we like to make up a batch and store it in the refrigerator so we can throw together a caesar salad on the fly ... an instant meal - just prepare the salad, pull the jar from the fridge, dress it, and Voila - home made caesar salad in an instant. There is always some ready for a quick salad snack. We would suggest you try a single serving (enough for one meal) first and find out what you really like in your caesar salad. Learn to make it the way you like it best. What ever you do, do not put the dressing on the caesars salad too far in advance of serving. While we like, for ourselves, to dress the salad before it comes to the table, many (you may find) prefer to dress it themselves directly on their plate. We always ask our guests if we may dress it in advance. If one does not like that, we will separate some out for them and dress the rest (because we REALLY like it dressed before it comes to the table). For those that really prefer to dress their own salad, serve the dressing on the side. We typically toss the dressing into the salad just before presenting it. We generally make it vegetarian (if you are vegan you may try some egg subsitute for the dressing) but, sometimes, anchovie bits may be tossed in. We do not eat pork so if we have company that loves bacon on their caesar salad will will fry up a piece of turkey or chicken bacon, cut it into small pieces, and add those into the salad. So, when does Caesar Salad become "not" Ceasar Salad? We don't know. It is made, by definition, with romaine lettuce. It would, otherwise, be salad with Caesar dressing ... but not Ceasar Salad. We suppose that's the minimum: Romaine and Ceasar dressing. Everything else - as you like it!